for being so generous and supportive of my efforts over this last year. 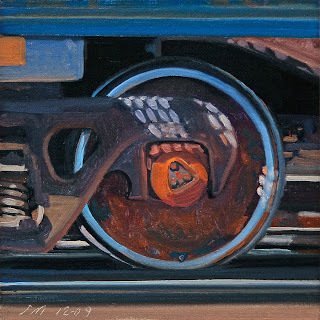 Without you, the making of artwork for this blog would not be possible. Wishing all of you the best for the New Year! 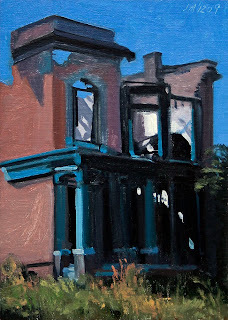 Today's painting is of sunlight and shadows on an abandoned and burned building in Detroit. Maybe a statement on this last year and decade in Detroit and everywhere else. Hoping for better times in the coming year. 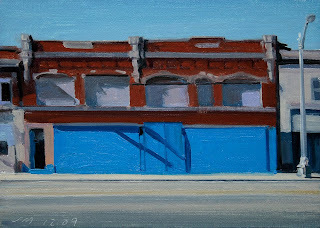 Today's painting is of sunlight and shadows on a Brush Park building in Detroit. It is at Brush St near Erskine St. 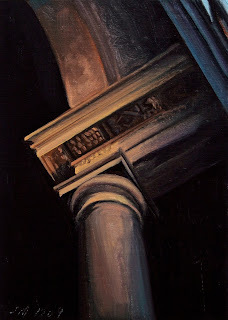 I really liked the way the sunlight caught the details on the column tops. 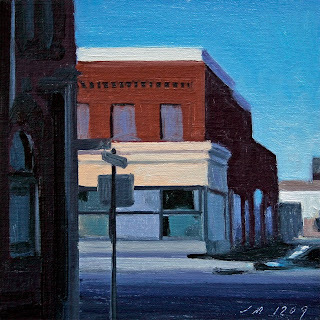 Today's painting is of sunlight and shadows on a corner building in Midtown Detroit. I really liked the primary colors and strong contrasts in this scene. 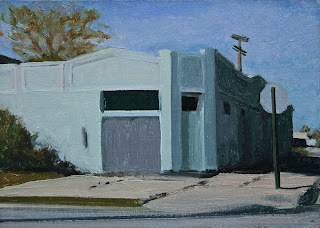 Today's painting is of sunlight and shadows on an abandoned storefront on West Jefferson Ave in Delray. This area has been very bad for more than 25 years. 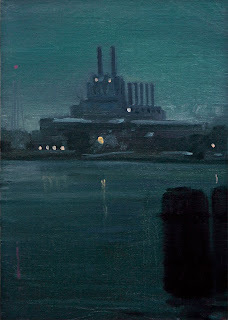 Today's Detroit painting is an industrial nocturne of the Marysville Power Plant on the Detroit River. 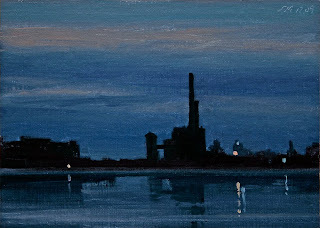 Today's Detroit painting is an industrial nocturne on the Detroit River, this is from the Detroit side. 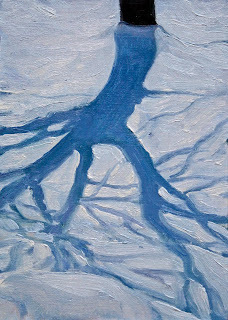 Today's painting is of shadows in the snow from a tree we planted in our front yard almost 20 years ago. Beautiful blue skies today. 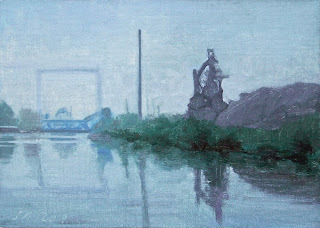 Today's Detroit painting is an industrial landscape with light fog on the Rouge River and Great Lakes Steel. 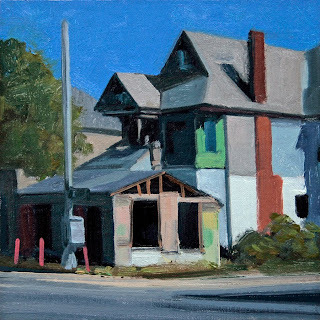 Today's painting is of an abandoned corner building on Chene Street. 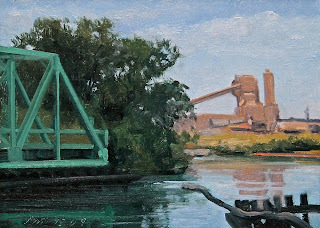 Today's Detroit painting is of an industrial landscape of the swing bridge at Zug Island over the Rouge River. This is the first view with the bridge open. 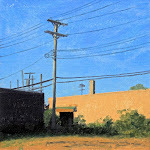 Today's painting is a detail of a column inside the abandoned Mi Central Train Station on Michigan Ave.
Today's painting is an urban street scene of a Detroit building at dusk, while putting in the wire I noticed a bird and was reminded of Leonard Cohen's song "Like a Bird on a Wire" one of my favorites artists. 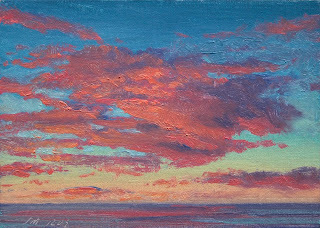 Today's daily painting is a nocturne on Lake Huron of very dramatic clouds at the tip of the Thumb. 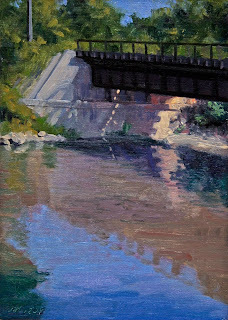 Today's painting is a scene of a bridge near Woodville Ohio over the Portage River. This river and Sugar Creek were places where I spent many wonderful hours exploring as a child. 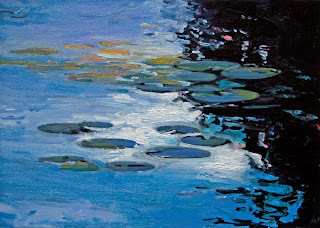 Today's painting is another scene of water lilies in a pond on Belle Isle Park. 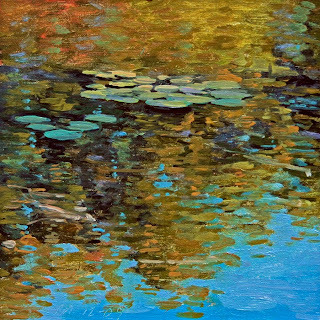 Today's painting is of a scene of water lilies in a pond on Belle Isle Park. 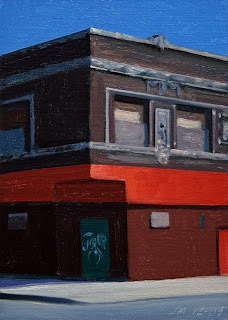 Today's painting is of a red corner building with deep shadows. 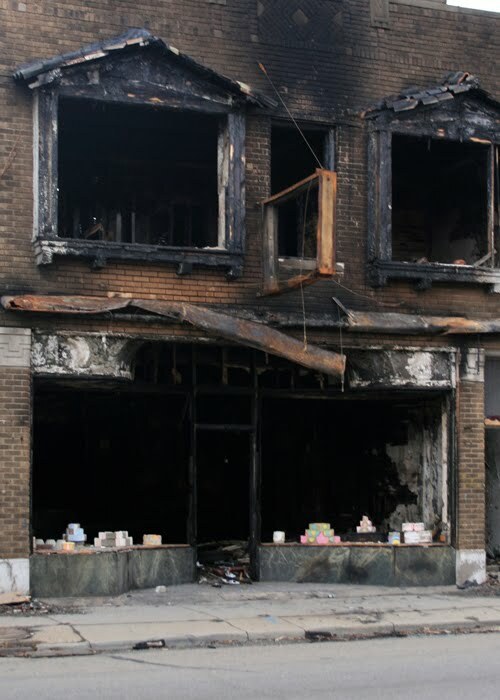 Another abandoned Detroit storefront. 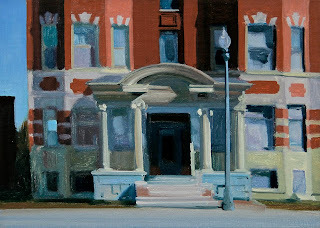 Today's painting is of shadows on a Jefferson Ave corner building in Delray. 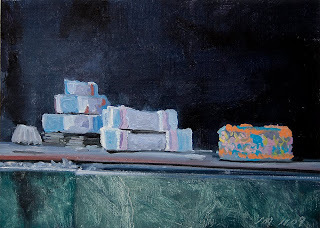 Today's daily painting is a nocturne of Lake Huron at the tip of the Thumb. 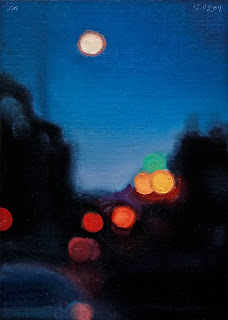 Today's daily painting is the forty-ninth in the Citylight series of blurred nocturnes of Detroit. 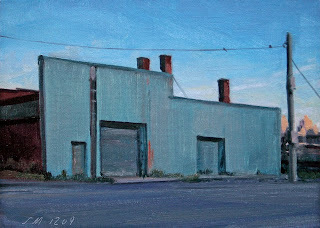 Today's painting is my 800th daily painting. 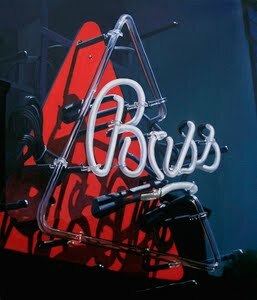 I want to thank everyone who has helped make this blog a success. Without your support I would not be able to do this. 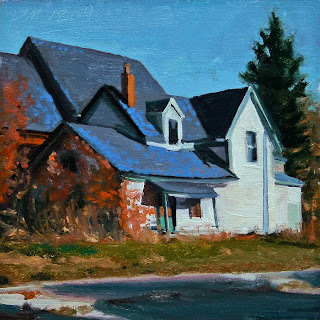 An abandoned white house with blue roof and ivy. 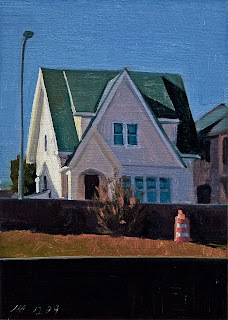 Today's painting is an urban house along the expressway with strong light and shadow. I really liked the abstract shapes in the foreground caused by the cement walls with the touch of color of the orange cone. 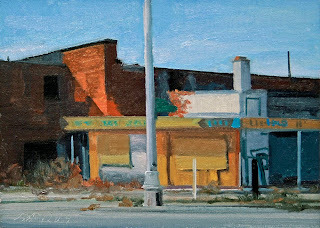 Today's painting is an urban street scene on the Eastside of Detroit. 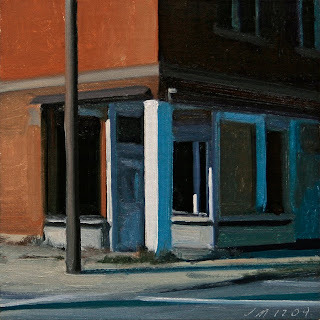 This image reminded me of a contemporary "Early Sunday Morning" by Edward Hopper. 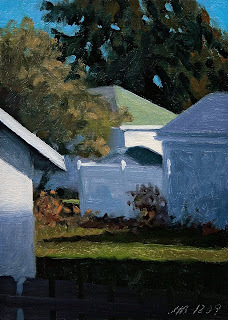 Today's painting is a scene from my back steps looking at my neighbors back yard with late afternoon light and shadows. The top of this large spruce tree was hit by lightning about 10 years ago, only the top was hurt. It is a great perch for the red tailed hawk that lives in the area. 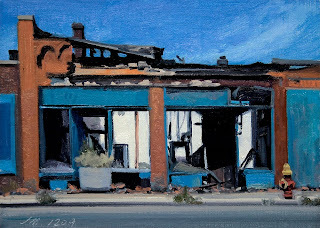 Today's daily painting is before and after paintings of the Van Dyke Pastry shop on Chene Street. There is an interesting art installation happening with this building. Please follow the links to get more of the story. Please see the Cupcake Girls for the whole story. Also check out Funky Sour Cream for additional photos and information on this installation. 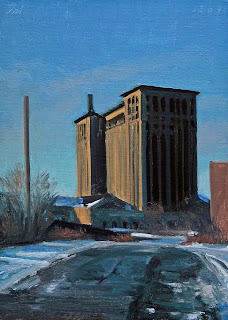 The fiftieth painting in the Abandoned Detroit series. 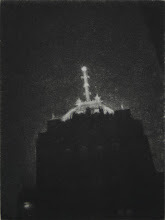 The forty-ninth painting in the Abandoned Detroit series.